WebLearn, the University’s virtual learning environment (VLE) is run centrally by the WebLearn team at IT Services (ITS). MSDLT work very closely with ITS and are your first point of call for help in the Medical Sciences Division, from getting started with WebLearn to making use of its more powerful features such as signing up for tutorials, peer marking and online surveys. Students on the Oxford Online Programme in Sleep Medicine (MSc/Dip/CPD) study part-time around other commitments. 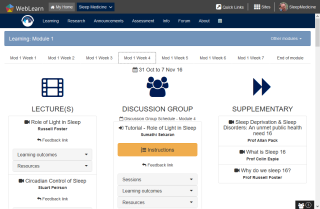 To enable to them to make the most of what little time they have for study, the Sleep Medicine WebLearn site automatically surfaces the current week's learning materials on students' personalised homepage. 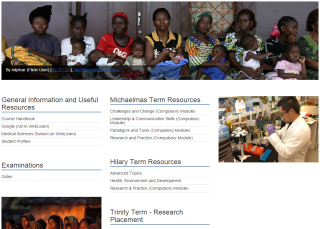 A unique personalised ‘portal’ for Biomedical Sciences - this won an OxTALENT award – including a more user-friendly face for My Workspace Resources, called “My Stuff”. Context-sensitive menus and drag and drop file upload are designed to encourage students to make better use of this facility within WebLearn. With our expertise in WebLearn and the room booking system, Rapla, we have been able to create a custom foyer display screen for the MSTC to guide students and visitors, and to make them aware of important announcements. Recognising that not everyone wants to have to edit HTML to create their site's homepage, we developed the Sakai Homepage Generator which enabled anyone, regardless of their technical skills, to create an appealing homepage from a folder structure in their site's Resources. How can I see what students are going to see?